KEMSA is a non-profit organization dedicated to the improvement of EMS in Kansas. 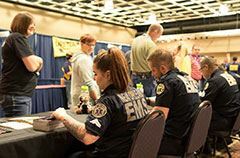 Therefore, KEMSA strives to provide educational opportunities and other events each year around the state that allow EMS professionals the opportunity to learn new skills, keep their skills sharp, and network to learn new things. This helps them better serve the citizens in their communities during a critical time in their lives. KEMSA events include: an annual KEMSA Conference & Expo each August; workshops for educators, administrators, and billing professionals; an annual golf tournament; other educational seminars; and more. January 21 - Just Culture Workshop, Wichita - REGISTER HERE (FULL). March 8 – Program Manager/Educator Workshop in Hutchinson, hosted by the KEMSA Educator’s Society - REGISTER HERE. April 5-7 – Spring Core Conference in Hays, KS - REGISTER HERE. May 17 – KEMSA Golf Tournament, Newton, KS - REGISTER HERE. As other events are scheduled, we will notify you about how to register and take advantage of these events. Being a KEMSA member gets you discounts to these events as well. Along with membership events, KEMSA board meetings are held every other month, a strategic planning session is held each fall, and committees meet by conference call. You can learn more about upcoming events by clicking on an event name under the events heading at the top of this website. We hope to see you at an event this year!